March 19, 2019 – The Canadian Arts Coalition (CAC) is pleased to see the government commit to a $16 million increase of the Canadian Arts Presentation Fund (CAPF) over two years in the 2019 Federal Budget as well as an impressive amount of other increases for the sector. The CAC advocated for this targeted investment in the creative value chain at Arts Day on the Hill 2018. More applause is heard from the arts sector for the timely investment of $20 million over two years in the Canada Music Fund and $24 million over two years to the Building Communities Through Arts and Heritage Program and the Celebration and Commemoration Program. With investments totalling $60 over four programs, this will ensure Canadians can experience more dynamic performances and exhibits at festivals. Lastly, the Canadian Arts Coalition was particularly pleased to see $1 million allocated over two years to Gender Based Analysis and the collection of disaggregated data at the Department of Canada Heritage. Several members of the Coalition referenced the need for more data about gender equality and diversity when they presented at the Standing Committee on Canadian Heritage’s Gender Parity study last year. The Canadian Arts Coalition would like to commend Minister Morneau for his recognition of the arts over the last four years beginning with the continuation of government funding of the Canada Council, and Minister Rodriguez for addressing several issues in his mandate letter and his sensitivity to the Canadian arts ecology. Overall, we appreciate this government’s commitment to Arts and Culture and can hope for continued investment moving forward. Please take a moment to send a thank you email or letter to your Member of Parliament using this template thank you letter. 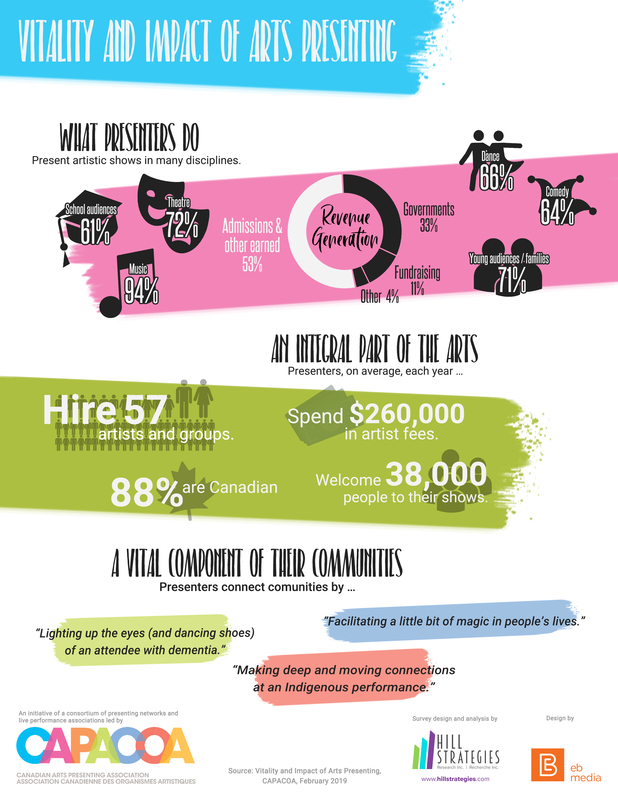 You may personalize the letter and include the infographic from the Vitality and Impact of Arts Presenting.